Chicken Cacciatore, the hearty Italian hunter is often overlooked in today’s world of ‘cultured’ cuisine. It may have fallen to the wayside after it’s peak in popularity in the 1970’s, maybe it’s been deemed too common. Well, today we’re bringing it back home. 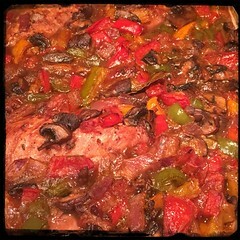 Our version is made with chicken, Barese sausage, bell peppers, and red wine. Cacciatore is traditionally made using chicken or rabbit. 2. After the sausages are removed, sear the chicken on all sides and place in the baking pan with the sausages. 3. Add 1-2 tbsp of olive oil and sauté the onions, when they begin to turn a bit translucent add the diced garlic and the optional Peperoncino Fiocchi (hot pepper flakes). 4. Add one cup of chicken stock to deglaze… let simmer for a few momrnts, mix well and pour over meat in baking pan. 5. Mix the cut peppers together and toss on top of the meat in the baking pan. 6. Add the bay leaves, salt and pepper. Then place the tomatoes on top. 8. Place in oven and let cook for at least 45-60 minutes mixing in 10-15 minute intervals. 9. After 45-60 minutes have passed taste the gravy and add 1 sprig of Rosemary, the lemon juice and additional salt and/or pepper (if needed) You can add some flour to achieve consistency of your liking. 10. For the final hour of cooking, turn up oven to 375F. 11. Mix fresh parsley in 5 minutes before serving.